immediate re-examination of any abnormal findings. 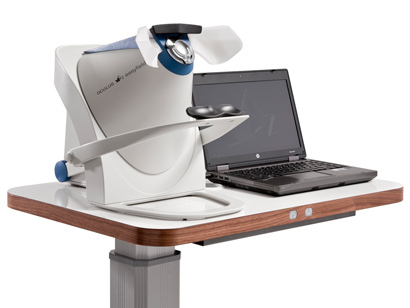 Ideal for all common examinations of the central visual field up to 30°. 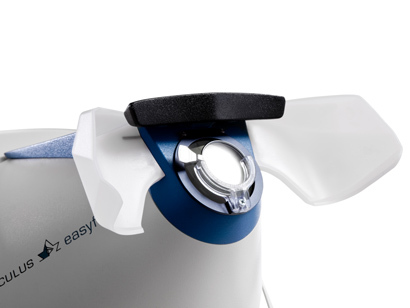 The Easyfield® C has an adjustable double chin rest and uses translucent eye shields for maximum patient comfort. High stability test strategies like SPARK and additional assessment tools improve the diagnostic value of the Easyfield® perimeter. 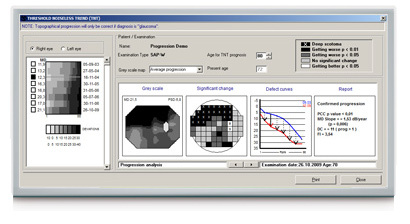 The enhanced Glaucoma Staging System (GSS2) of Dr. Brusini and the Glaucoma Staging Program (GSP) expert systems offer extended support in the single field analysis. The Threshold Noiseless Trend (TNT) carries out efficient progression analysis. 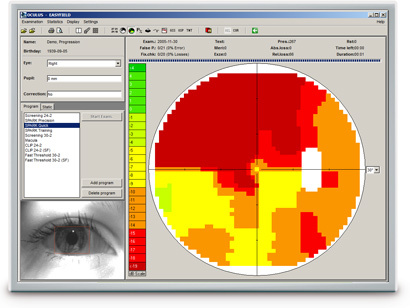 Examination quality is ensured by a patented fixation control algorithm, a high resolution video camera for eye monitoring and the various built-in catch trials. 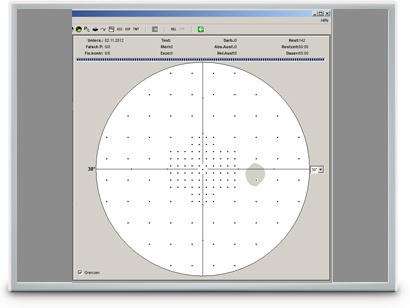 The Easyfield® comes with a set of predefined programs for most frequently needed examination routines of the central visual field or the macular area. The program list can be easily extended according to specific requirements by combining the available test patterns and test strategies. 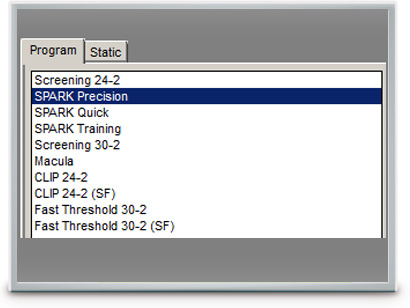 As a screening unit, the Easyfield® perimeter generally uses threshold related suprathreshold examination strategies. These have the advantage of providing the examiner with a meaningful overview of the tested area despite the short examination time. Multiple test strategies are available for evaluating the accurate numeric values of the sensitivity thresholds. The OCULUS "Fast Threshold" reduces test duration by implementing clever improvements of the classic 4-2 step method. The CLIP strategy achieves a similar performance using a new type of stimulus presentation. 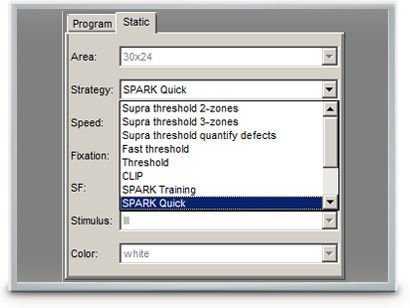 The novel and unique SPARK strategy provides rapid and reproducible threshold measurements specifically developed for glaucoma patients. 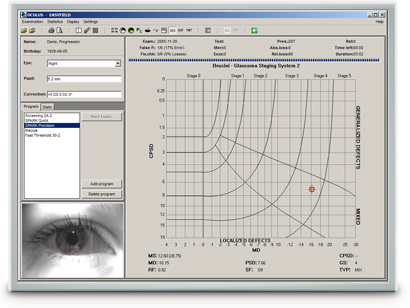 The enhanced Glaucoma Staging System (GSS 2) of Brusini classifies visual field defects based on the perimetric indices MD (Mean Deviation) and PSD (Pattern Standard Deviation). The representative point of the examination is placed in a chart according to the values of these indices. The chart displays defined areas for the different stages of disease (Stage 0 – Stage 5) and separates generalized, localized and mixed defects. Glaucoma Staging Program (GSP)The Glaucoma Staging Program (GSP) is based on pattern recognition and is dedicated to early detection of glaucoma. 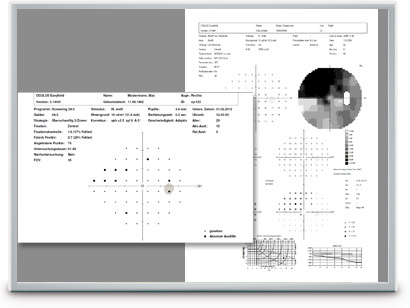 The GSP software places examination findings into visual field classes (normal, glaucomatous, artifactual and neuro) based solely on their appearance. In addition, risk classes (normal, suspect, pre-perimetric, early stage, moderate and severe) are also assigned to findings that are classified as normal or glaucomatous. The evaluation results are presented in intuitive green-yellow-red color coding. The striking novelty of the GSP is its ability to detect subtle changes in the visual field associated with early stage glaucoma. Findings of suspect and pre-perimetric risk classes may contain reductions in the visual field that cannot be readily seen by the examiner. They usually remain undetected also by standard perimetric indices. 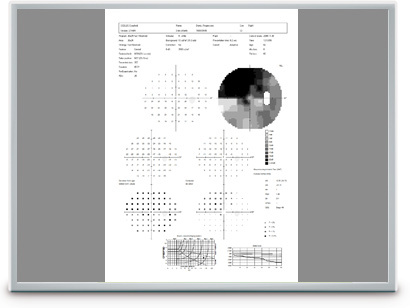 TNT provides a quantitative, statistical analysis of the visual field examinations conducted overtime. 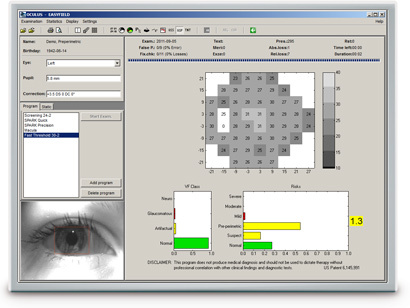 For follow-up purposes the software uses all visual field results taken over the entire observation period and takes the patient's threshold values into account obtained on the 30-2, 30x24 or 24-2 patterns. TNT uses a specific filter to reduce the fluctuation range of the threshold values and to perform a consistent trend analysis. In conjunction with the fast SPARK strategy, the sensitivity of detecting progression in early stage glaucoma is greatly improved.